Dating back to 1810, this is a church dedicated to St. George. Resembling the churches of medieval Europe, the church is an important destination for Christian as well as non-Christian pilgrims. Built when Father Thomas Olakkapady was the vicar of the area, the church is known for its miraculous prayers that help in healing mental disorders. The annual fest is held in the month of May. 06:00 am, 07:00 am and 04:00 pm on Fridays. 06:00 pm, 08:00 am, 10:00 am and 04:00 pm on Sundays. 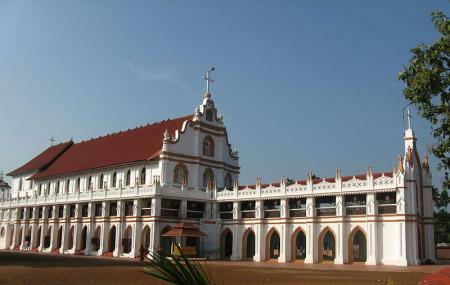 How popular is St.george's Forane Church? People normally club together Ambalapuzha Shree Krishna Temple and Mannarasala Temple while planning their visit to St.george's Forane Church. Good place to visit. Famous church with lot of people visiting. The festival is famous and starts in April. The church have lake adjacent to it. Big church with lot of traditions. Near to that there is a big river. Nice river for to swin and make some good Fun time with friends.. Totally Beautiful place. Church is old built, well maintained, inside church if you enter you can feel the positive energy. Church outsides have been fully paved with paving tiles so that on raining season also its clean, All religion people comes to Edathua church for offering their prayers and get rid of their worries. Peace full ambience. Beautiful church and the location is awesome ,green place with river water and the breeze gives you very supernatural feel. St.George of this church is respected by all section of people regardless of their religion. People offer prayers for their protection against the evil spirits. Also many people get deliverence from the haunt of evil. Many offer the miniature sculptures of snakes as thanksgiving for protecting them from poisonous snakes. Once you visit you believe. Very calm and peaceful ambience. Well maintained structure which is built in 1800's. Clean and tidy surroundings. Spacious parking ground. Well maintained washrooms and toilets.